I’ve been looking for a pair of camo pants and found the perfect pair from Stage Stores. I know what you’re thinking. Camo is straight off the army/surplus store shelves and anything but fashionable, but this is not your husband’s or dad’s camo! The Signature Studio brand pants I bought are ankle length (full length on me since I’m barely 5 ft. 2”) with fun zippers at the ankles. They are also incredibly soft. When I think of camo material I think tough, durable, rigid, stiff…anything but comfy, but these are so soft. Camo is really as versatile a neutral and I can see me wearing these year round. I can’t wait to wear them this fall with my favorite black riding boots and perhaps a white lace tank and a blazer or even just with a denim shirt and boots. I traveled to Houston this week for a fashion panel and was feeling inspired by all my fellow fashion enthusiasts. While there I put together a fun outfit pairing up my new camo pants and a deep coral/orange Trinity top I have had for years. 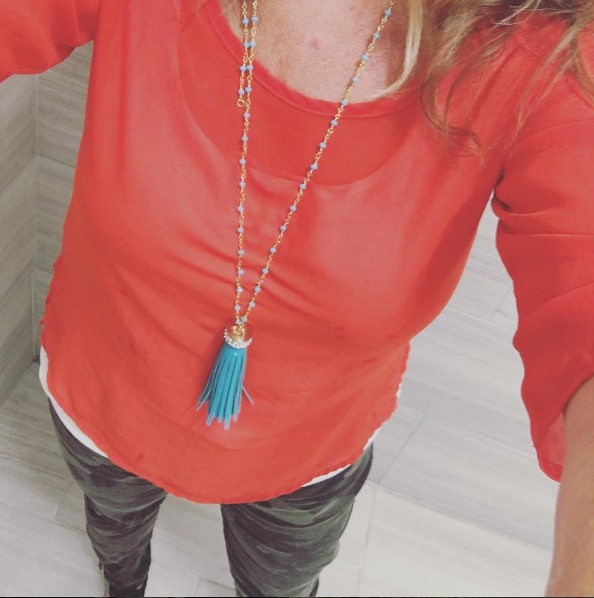 I added a fun feminine pop of color with a turquoise leather tassel necklace which I bought months ago on Zulily. It’s out of stock but I’ve linked to similar necklaces below. I love how this casual outfit turned out and posted it on Instagram. I have on black gladiator sandals, which you can’t see in the pic. These great camo pants are $40 at Stage Stores but they’re having a fabulous BOGO sale this weekend so you can snag two $40 pairs of pants for just $20 each or get a top for free to go with them (there are some restrictions on the BOGO sale so be sure to read them and check your online shopping cart as you shop). Here are four similar tops if you want to recreate this look! 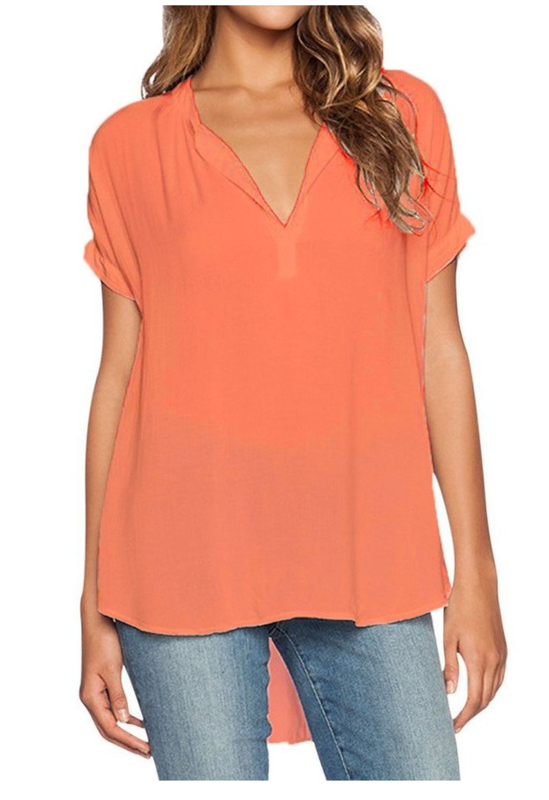 Junior size coral button accent top from Stage Stores (on clearance for $9.99 and also comes in a great purple/blue shade). 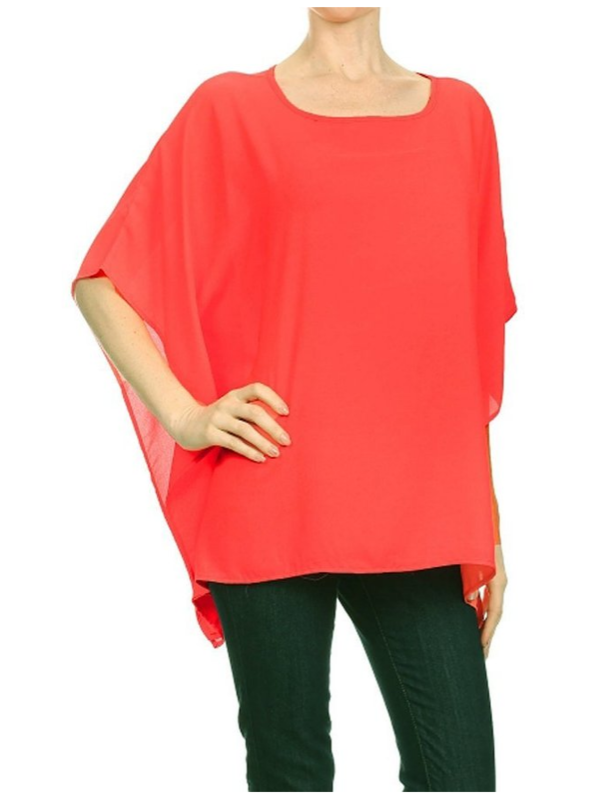 Modern Kiwi brand chiffon tunic from Amazon (also comes in a fun lighter orange). 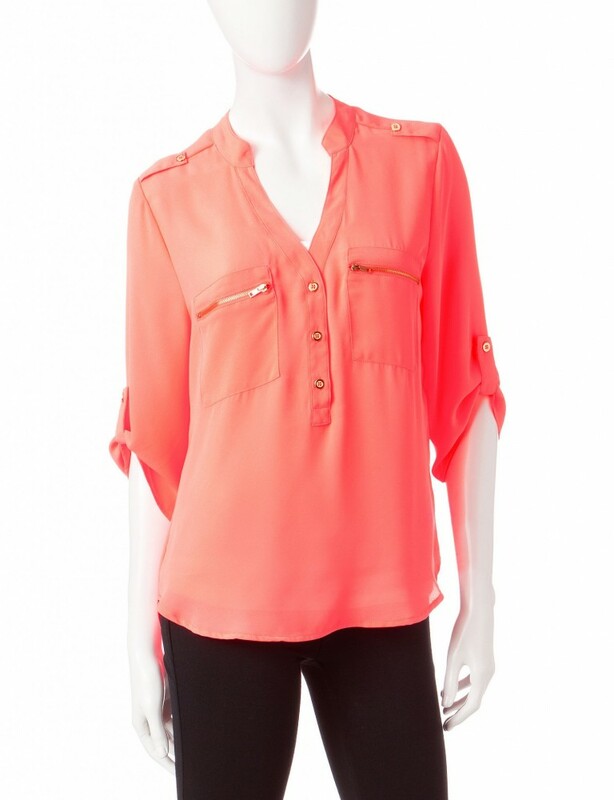 This top is just $28 and includes free shipping. 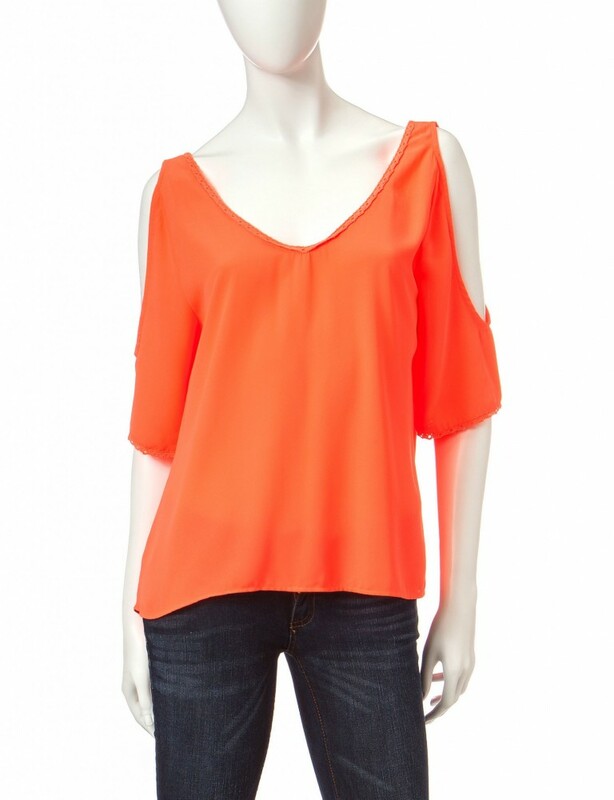 Stage Stores cold shoulder top from the junior department. This style is really in right now and this top is currently just $9.99. Here’s another great Wishful Park brand top from Stage Stores with fun zipper accent. Love this and it’s on sale for $9.99. Win! It also comes in black and olive green, which are both perfect for transitioning into fall. Lastly, Prep Obsessed has a TON of cute tassel inspired accessories. 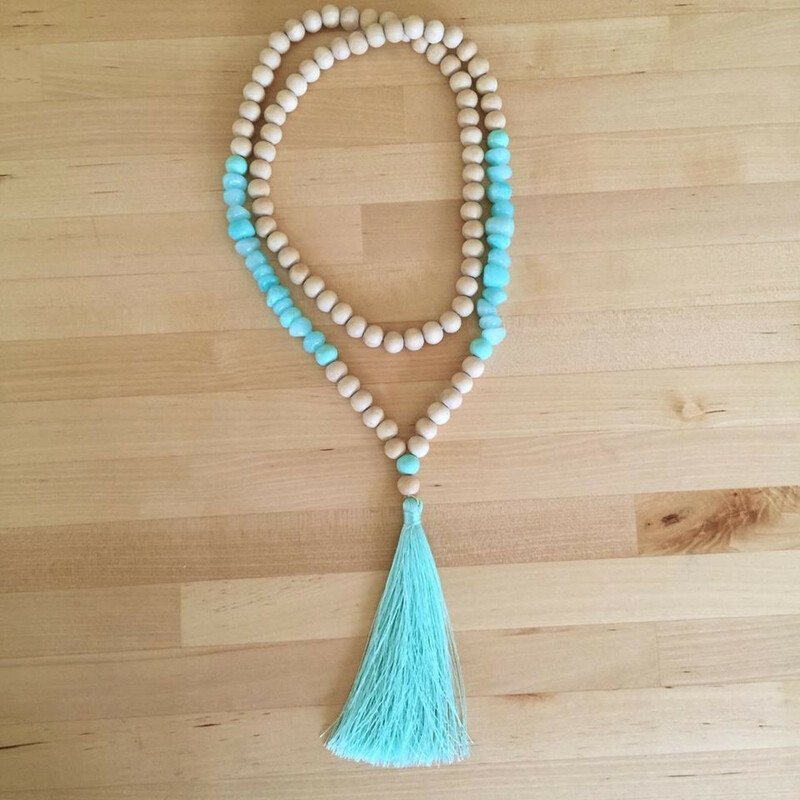 I love, love this newly added Brooke Beaded Tassel necklace for $24.95. And another very cute option for just $14 is this brass cap leather tassel necklace from Accessory Concierge, which is a site I just discovered on Sheaffer Told Me To (which if you do NOT follow you and you love fashion you definitely should add to your must reads!) I love all the colors as well as the price! Do you own a pair of camo pants or jeans? How do you style them for summer? This entry was posted in Fashion Friday and tagged Fashion Friday.